Over the last few months, I’ve presented at three conferences ( Tech Ed, IT Pro, Microsoft’s internal Tech Ready ) about building software as a service solution with Microsoft Dynamics CRM. Now that all the conferences are over, I’m making more of this content available to you our readers, partners, and ISVs. I’ve created a video of the solution demonstration at http://www.democrmonline.com/WordProposalIntro/ which is also available from the home page of the http://www.democrmonline.com site. This demo is a nice example of the value of software + software as service. 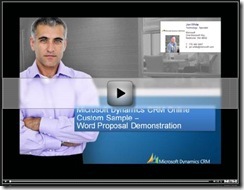 The solution demonstrates Microsoft Dynamics CRM Online data both being hosted in Microsoft Word and inserted into a Word document. Microsoft Dynamics CRM offers you other means without custom code to get data into Microsoft Office products such as Word, Outlook, and Excel. The advantage of this solution is that you get more flexible control of content formatting and the interface is familiar and thus user friendly. I’ll be posting more video’s showing how to build the solution in the near future so stay tuned. And let me know what you think of this demonstration.